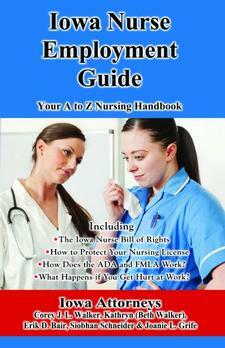 Learn more about five important rights that all Iowa injured workers have. Since 1997 Iowa Attorney Corey Walker who practices primarily in personal injury law (car and motorcycle accidents) has represented more than 1,000 Injured Iowans including many Iowans injured in car accidents. 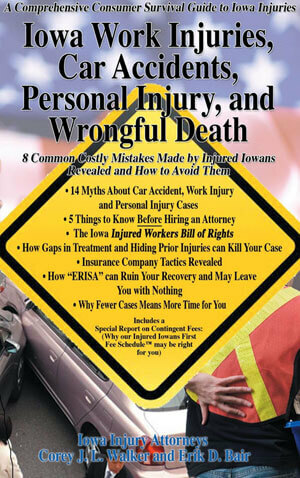 He explains common mistakes to avoid when dealing with an Iowa car accident case. For more than 20 years Iowa Personal Injury Attorneys Erik Bair and Corey Walker have represented more than one thousand Iowans who have been injured including many Iowans injured in motorcycle accidents. 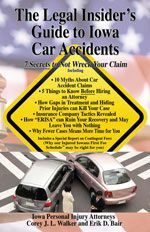 They explain five things to do so that you will receive a fair settlement in your Iowa Motorcycle case. 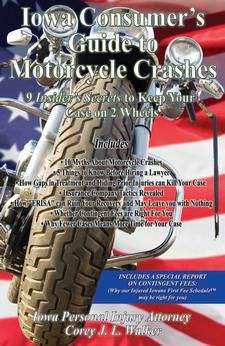 So to learn how to avoid a costly mistake in your motorcycle accident case request your copy now. Since 1997 Iowa Personal Injury Attorney Corey Walker has represented more than 1,000 Injured Iowans including many Iowans injured in dog bites and attacks. He explains four things you must know if you have an Iowa dog bite case. 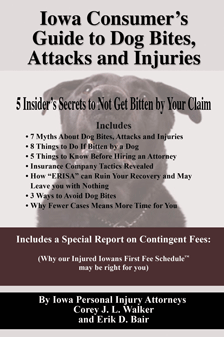 So to learn how to avoid a costly mistake in your dog bite case request your copy now. There is no cost, risk or obligation. If you are looking for an attorney in a state other than Iowa you can try here.